G. H. Hardy (born as Godfrey Harold Hardy in Cranleigh, Surrey, England, died in Cambridge, Cambridgeshire, England) was a famous Mathematician from United Kingdom, who lived between February 7, 1877 and December 1, 1947. He became 70 years old. Godfrey Harold Hardy was a famous English mathematician. Hardy is known for its achievements in number theory and mathematical analysis. He was called "Harold" by a few close friends, but is otherwise known as "GH". Among non-mathematicians, he is probably best known for his essay on the aesthetics of mathematics: A mathematician's Apology (1940). This work gives a good insight into how mathematicians think, and it is written for people who are not mathematicians themselves. Hardy is also known for taking care of the Indian mathematician Srinivasa Ramanujan Aiyangar. Although Hardy has said that the discovery of Ramanujan's his most important contributions to mathematics. He is born under the zodiac aquarius, who is known for Knowledge, Humanitarian, Serious, Insightful, Duplicitous. 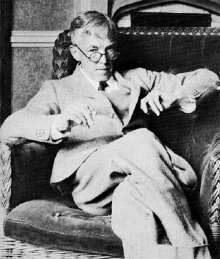 Our collection contains 7 quotes who is written / told by H. Hardy. "A mathematician, like a painter or poet, is a maker of patterns. If his patterns are more permanent than theirs, it is because they are made with ideas"
"Pure mathematics is on the whole distinctly more useful than applied. For what is useful above all is technique, and mathematical technique is taught mainly through pure mathematics"
"It is not worth an intelligent man's time to be in the majority. By definition, there are already enough people to do that"
"Archimedes will be remembered when Aeschylus is forgotten, because languages die and mathematical ideas do not"
"I am interested in mathematics only as a creative art"
"Young men should prove theorems, old men should write books"
"There is no scorn more profound, or on the whole more justifiable, than that of the men who make for the men who explain. Exposition, criticism, appreciation, is work for second-rate minds"